A team of scientists at the Wyss Institute for Biologically Inspired Engineering at Harvard University has discovered why long-term treatment with many common antibiotics can cause harmful side effects — and they have uncovered two easy strategies that could help prevent these dangerous responses. They reported the results in the July 3rd issue of Science Translational Medicine. The results mean that "doctors should only prescribe antibiotics when they’re called for, and patients should only ask for antibiotics when they have a serious bacterial infection," Collins said. Antibiotics cause oxidative stress in cells, which leads to cellular damage. 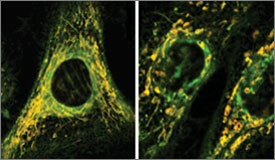 For example, in healthy cells (left), mitochondria, which are labeled yellow here, are long and highly branched. But in cells treated with the antibiotic ciprofloxacin (right), mitochondria are abnormally short and unbranched, and they do not function as well. Image credit: Sameer Kalghatgi and Catherine S. Spina. "Jim and his team are moving at lightning speed toward unlocking the medical mysteries that stand in the way of safe and effective antibiotic treatment," said Don Ingber, M.D., Ph.D., Wyss Institute Founding Director. "Doctors have known for years that antibiotics occasionally cause serious side effects, and Jim’s new findings offer not one but two exciting new strategies that could address this long-neglected public health problem." "We’re interested in seeing if this could be moved toward the clinic," Collins said. This work was funded by the National Institutes of Health Director’s Pioneer Award Program, the Howard Hughes Medical Institute, and the Wyss Institute for Biologically Inspired Engineering at Harvard University. In addition to Collins, Kalghatgi, and Spina, the research team included James C. Costello, Ph.D., a former postdoctoral fellow on Collins’ team who’s now an Instructor of Medicine at Harvard Medical School; Ruben Morones-Ramirez, Ph.D., a former postdoctoral fellow on Collins’ team who is now a professor at Universidad Autònoma de Nuevo Leon in Mexico; Shimyn Slomovic, Ph.D., a postdoctoral fellow on Collins’ team; Anthony Molina, Ph.D., Assistant Professor at Wake Forest School of Medicine; Orian Shirihai, Ph.D., Associate Professor at Boston University School of Medicine, and Marc Liesa, Ph.D., a research associate on Shirihai’s team at Boston University School of Medicine. The Wyss Institute for Biologically Inspired Engineering at Harvard University (http://wyss.harvard.edu) uses Nature’s design principles to develop bioinspired materials and devices that will transform medicine and create a more sustainable world. Working as an alliance among Harvard’s Schools of Medicine, Engineering, and Arts & Sciences, and in partnership with Beth Israel Deaconess Medical Center, Brigham and Women’s Hospital, Boston Children’s Hospital, Dana Farber Cancer Institute, Massachusetts General Hospital, the University of Massachusetts Medical School, Spaulding Rehabilitation Hospital, Boston University and Tufts University, the Institute crosses disciplinary and institutional barriers to engage in high-risk research that leads to transformative technological breakthroughs. By emulating Nature’s principles, Wyss researchers are developing innovative new engineering solutions for healthcare, energy, architecture, robotics, and manufacturing. These technologies are translated into commercial products and therapies through collaborations with clinical investigators, corporate alliances, and new start-ups. The Wyss Institute recently won the prestigious World Technology Network award for innovation in biotechnology.